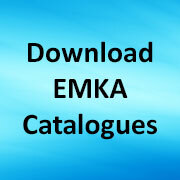 Our 2013 EMKA ECHO catalogue supplement introduces new quarter-turn locks and cams (including rod control), as well as a new IP65 swinghandle for key cylinders or padlock, also with dual cylinder and padlock capability. These new items follow a market trend that sees increasing call for enhanced strength and temperature capability as specialist cabinets are expected to perform their role in harsher environments, where for example, custom silicone seals may be specially requested. The Program 1022 in AISI 303 offers IP65 protection in a compact quarter-turn format with industry standard “spanner lock” inserts. The 1048 in AISI 316 comes standard with EK333 key, and has other key types available. 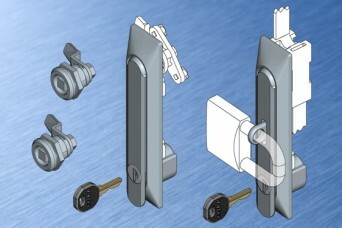 Associated with both these quarter-turns is a wider selection of cams providing many different depth options. The companion 1150 swinghandle program in AISI 316/303 provides all the benefits of a traditional swinghandle design, together with the additional performance of stainless steel. Spanner lock inserts are available, as is a wide offering of cylinder key types and a padlockable variant which can be used solely with the padlock or together with a key system for dual level security. Stainless steel fixing accessories ensure an installation that is fully compatible with high grade specialist fabricated stainless steel housings. Share the post "New Stainless Steel Locks and Swinghandles for Higher Specification"
Next post: Our 1117 Pin Hinge is the “Top and Bottom” of it!